One of the great pleasures of living in West Marin is the variety of wildlife I see around my cabin every day. Here is a sampling of the creatures I saw last Friday, beginning with a salamander. These amphibians have more of a history than one might think. As someone who heats his cabin with a woodstove, I go out of my way to insure no bugs are sent to a fiery death in the inferno. I’ve gone so far as to dislodge a hibernating yellow jacket before sticking its log in the fire. A week ago, I was about to toss a piece of firewood into my woodstove when I spotted a salamander hiding in one of the log’s cracks. Much relieved that I had discovered the hapless amphibian in time, I naturally put it back outdoors. Many ancient Greeks and Romans believed that salamanders are born in fire. Some salamanders inhabit rotting logs, and when the logs were put in a fire, the salamanders would try to escape, leading people to believe that salamanders were created by the flames. Finding a salamander in my firewood a week ago made me doubly alert for others, and on Friday I found a second. I placed the second salamander among some flowers growing in a wine barrel on my deck, only to have a woodrat jump out of the barrel the moment I did so. 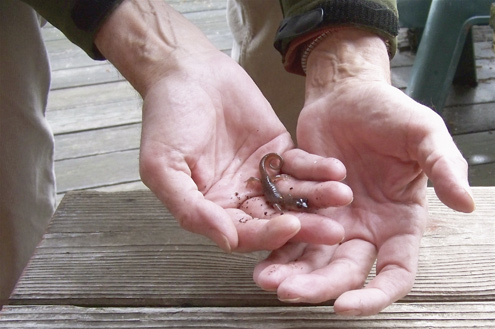 Immediately I worried that I had saved the salamander from fire only to feed it to a woodrat. The salamander, however, quickly crawled out of sight, and there was nothing to be done. 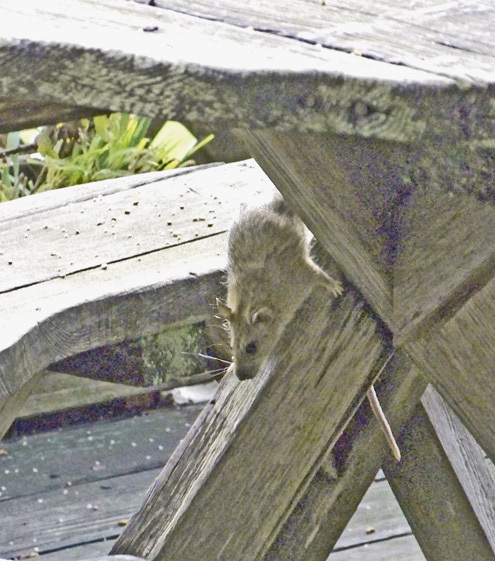 A woodrat on the leg of my picnic table last Friday. 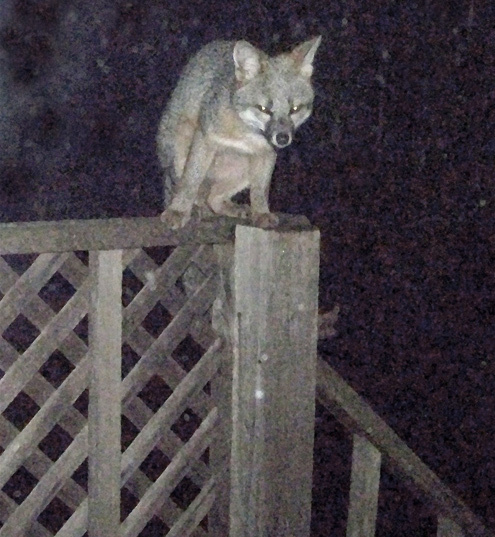 Foxes and raccoons have become regular nighttime visitors on my deck, as has been noted in several postings. 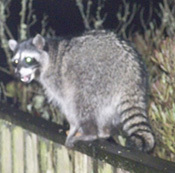 Also on the railing Friday night was this raccoon. The two are not fond of each other, but after I spent several weeks conditioning them, they learned to get along in order to share in the peanuts I scattered outside my kitchen door. My technique was one I’d previously used in convincing a possum and raccoon to dine together. Initially I put out two piles of peanuts several feet apart — one for each species — and over the course of several nights moved the piles closer together until the critters were eating nose to nose. A possum, fox, and raccoon share a nighttime snack. On Friday night, this conditioning reached new heights when a possum, fox, and raccoon all showed up. 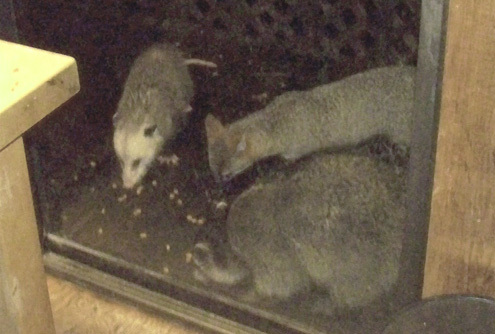 By placing peanuts fairly close together, I was able to get all three critters to eat nose to nose without squabbling. Afterward I wondered if they were as amazed as I at what had just occurred. It was the perfect culmination of a single day spent watching my smaller neighbors. Sparsely Sage and Timely is powered by	WordPress 4.9.10 and delivered to you in 0.593 seconds using 56 queries.